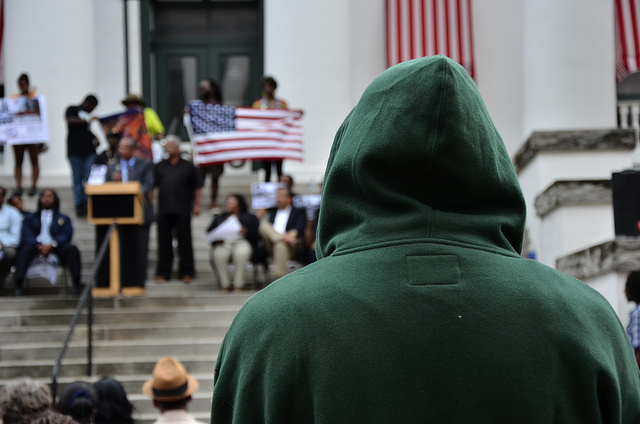 A man with hoodie watches the speakers on the steps of the Historic Capital Building in Tallahassee, Florida at a Rally March for Trayvon Martin. We probably don&apos;t have to introduce the story of Trayvon Martin; rarely does one story start so small and get catipulted to a level where the President of the United States feels he must make a comment. This aspect of the Trayvon story speaks to something I&apos;ve known my whole but I am just getting around to understanding: Race, for Latinos, is a sticky and complicated thing. We&apos;re one ethnic group, with a shared language and culture, but there are many different racial identities within that. And the experience of being a white Hispanic in this country, like me, is different than the experience of being a black Hispanic. And, sadly, being part of this diverse minority group, and having friends and family and neighbors of different colors that you share this deep cultural connection with – that doesn&apos;t automatically keep you from being a little bit – or, possibly in the case of Zimmerman – a lot racist."